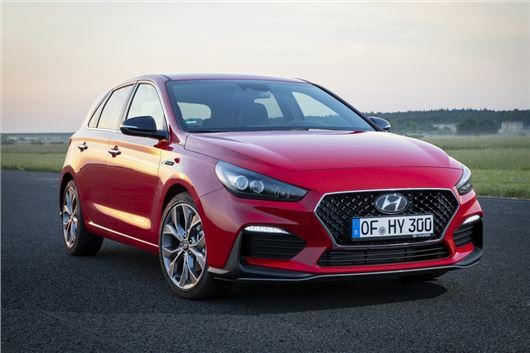 Hyundai is launching a new N Line trim for the i30, adding sporty design features from the i30 N. On sale this summer, the N Line models also get tuned suspension and brakes. In a similar fasion to Ford's ST-Line models, the N Line will give the i30 a sportier look, with restyled front and rear bumpers (including a rear diffuser of sorts), 18-inch alloy wheels and twin exhaust pipes. Inside, there are N-branded sports seats finished in suede, a perforated leather sport steering wheel and the N gear lever. But the changes are more than just skin deep, with N Line models also getting changes to the mechanical set-up. These include stiffers suspension, uprated brakes and a retuned throttle response. The 18-inch alloys - a first the i30 - are fitted with PS4 Michelin Performance tires plus there are new 16-inch front brakes. The i30 N Line goes on sale in the UK this summer and is available with the 140PS 1.4-litre T-GDI petrol engine or the 1.6-litre CRDi diesel engine with 136PS.